You may be starting a health testing program for regulatory compliance, or you may be seeking ways to benchmark and improve the health of your staff through a wellness program. Whatever the driver for the program you are looking to launch, there are nine vital components to ensuring its success. Predictive Solutions predicts injuries before they occur. Our technology predicts the likelihood, frequency and location of workplace injuries using customers' observation data. Whether executing a behavior or condition-based safety program, many customers need help in strengthening their safety culture and processes. Learn how the team that helped design Watson – the Jeopardy show winning super computer – is helping Predictive Solutions and its customers predict workplace injuries. Among the many myths about oral fluid testing, is the language of drug testing laws in each of the 50 states. 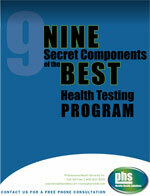 This guideline outlines the current laws regarding drug testing in an easy to follow matrix listed by state.